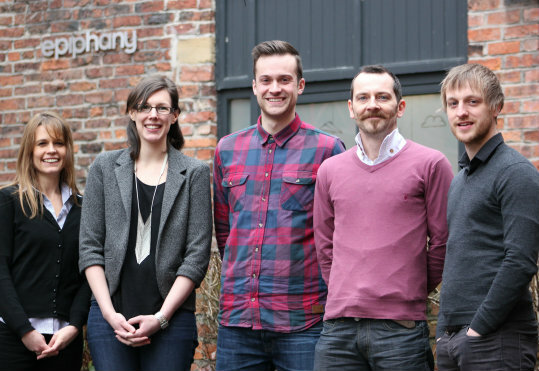 Leeds search marketing agency Epiphany has made five senior appointments as it continues its recent period of expansion. The new recruits take Epiphany to a total workforce of 110 digital marketers across its offices in Leeds and London. The Epiphany Group also recently established two subsidiaries in the form of Epiphany Digital, in Sydney, and Shackleton, the Group’s Leeds-based social media and PR specialist. Rachel Evans, a chartered occupational psychologist, joins in the new role of talent development manager, while Honor Baldry, Chris Morton and Russ Crooks become senior account managers. (L to R): Rachel Evans, Honor Baldry, Chris Morton, Tony Jacobs and Russ Crooks. Baldry, a former senior account manager at MadeByPi, has worked with clients such as Ronseal, Channel 4 and Transform Cosmetic Surgery Group, while Morton previously held a series of roles at Google including technical specialist, analytics specialist and AdWords strategist. Crooks joins after five years specialising in PPC at Summit Media, working with clients including Argos, Selfridges and Viking. Tony Jacobs moves from Sense Internet to take the role of creative content studio manager, bringing experience of clients such as Rizla, Travelodge, BAFTA and Helly Hansen. Epiphany Group CEO Rob Shaw said: "We’re forecasting another 12 months of extremely strong growth and I’m delighted that we continue to attract the most talented minds in the industry. "We’ve recently won a series of major new clients including Virgin Holidays and Safestyle UK and we’re just finalising the details on our new Leeds offices that will give us space to keep growing the agency."